Need directions? Are you good at getting lost? 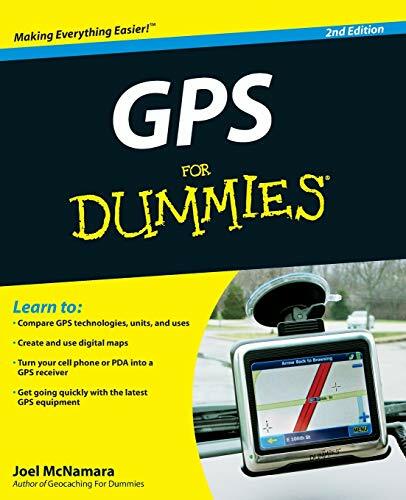 Then GPS is just the technology you've dreamed of, and GPS For Dummies is what you need to help you make the most of it. If you have a GPS unit or plan to buy one, GPS For Dummies, 2 nd Edition helps you compare GPS technologies, units, and uses. You'll find out how to create and use digital maps and learn about waypoints, tracks, coordinate systems, and other key point to using GPS technology. Get more from your GPS device by learning to use Web-hosted mapping services and even how to turn your cell phone or PDA into a GPS receiver. You'll also discover: Up-to-date information on the capabilities of popular handheld and automotive Global Positioning Systems How to read a map and how to get more from the free maps available online The capabilities and limitations of GPS technology, and how satellites and radio systems make GPS work How to interface your GPS receiver with your computer and what digital mapping software can offer Why a cell phone with GPS capability isn't the same as a GPS unit What can affect your GPS reading and how accurate it will be How to use Street Atlas USA, TopoFusion, Google Earth, and other tools Fun things to do with GPS, such as exploring topographical maps, aerial imagery, and the sport of geocaching Most GPS receivers do much more than their owners realize. With GPS For Dummies, 2 nd Edition in hand, you'll venture forth with confidence! You are here. Read on to see how to use GPS to get where you're going! Got a GPS unit? Planning to buy one? Here's how to get all the benefits from that handy device. Most GPS receivers do much more than their owners realize. This book covers the basics (waypoints, tracks, coordinate systems) but also tells you all about using digital maps and Web-hosted mapping services, so you can venture forth with confidence.